Ever wandered into a club, restaurant or even someone’s living room and just enjoyed every single song that played there? I’ve had that happen several times in my travels, but launching SoundHound and engaging the ‘listen to identify track’ feature every time is a pain. Thankfully, Shazam has a solution. 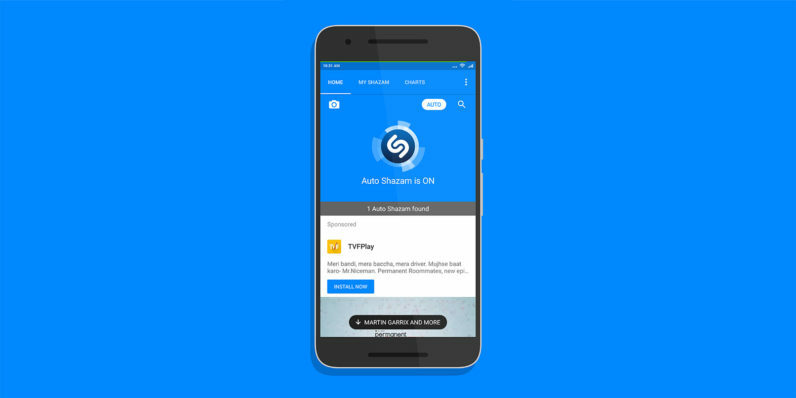 It’s new Auto Shazam feature, available now in its Android app, keeps listening for as long as you have it turned on and quietly identifies every song that it hears. It even works in the background, which means you can use other apps or even leave your phone alone while it creates a list of tracks that played around you. I’ve been partial to SoundHound until now simply because it was able to name some obscure music that Shazam couldn’t. But this new feature is exactly what I’ve been looking for in a song identification app and it looks like I’ll have to make the switch to Shazam. In addition to reducing the awkwardness of having to stare at your screen while the app identifies songs, it’s also an interesting way to document the kind of music you heard at a certain place and time, like a memorable vacation, a celebratory party or a special evening with your significant other. To that end, the feature could use some work. I’d love to be able to generate a playlist on Spotify or YouTube from all the tracks I Shazamed during a listening session, or save it for posterity in the app and add notes about where I was when I heard those songs. For now, it’s a convenient way to identify multiple songs without having to fumble with your phone. And that’s something Shazam should have introduced a long time ago. The new feature is now available on Shazam’s free app, which you can grab from Google Play.